There have been quite a few gorgeous playrooms popping up on Pinterest lately with a focus on vintage Fisher Price toys. 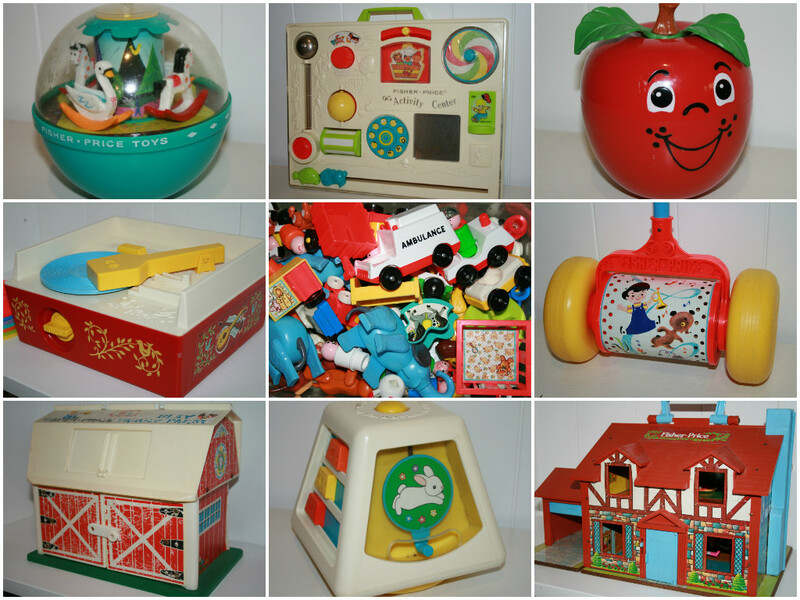 We were really fortunate when we were little that our Dad worked for Fisher Price. For some reason our parents kept and stored all of our childhood toys away in their loft. And boy am I glad they did! About two years ago Mum and Dad decided they wanted to reclaim their loft space and called my brother, sister and I to go through all of the boxes (and boxes and boxes) of toys, take what we wanted for our own children and what ever was left over would go to charity. Both of my girls love love love "Happy Apple"
A big box of figuerines. animals, cars and furniture. This is probably my favourite item - a Fisher Price Record Player in perfect working order. More than one little child has asked "Whats a Record?" - haha! As well as the Fisher Price, I also brought home all of our little dolls and figurines including original Strawberry Shortcake, Care Bears and My Little Pony. I'll save sharing them for another post. I'm so grateful to my parents for keeping everything. My girls absolutely love playing with all the old toys and it is adorable to see my daughters playing with our childhood treasures that we all loved so much. I look forward to carefully popping them away one day to give my girls for their children.